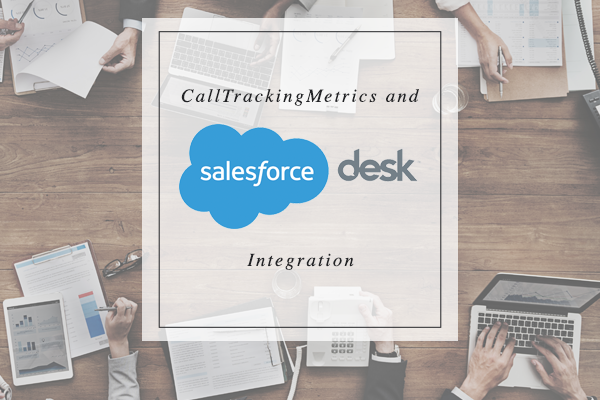 CallTrackingMetrics allows you to take your customer service to the next level with our new Salesforce Desk integration. We’ve all been there, when you need to make that dreaded service call. You know you’re in for a series of call transfers from IVR to IVR, agent to agent, and that you’ll have to repeat information over and over again. It’s frustrating for you and an extremely inefficient use of resources for the call center. Thankfully, those days are over with the use of CallTrackingMetrics and Salesforce Desk ticketing. This powerful integration allows you to sync your Desk tickets with your inbound phone calls, equipping your team with the knowledge they need to be customer service superheroes. Agents will be able to pull live tickets linked to the customer’s contact information, saving both the caller and agent time and unnecessary frustration. Link your Desk tickets to CTM today!